We’re now in Top 8! Just 3 more Matches before we crown a new YCS Champion! 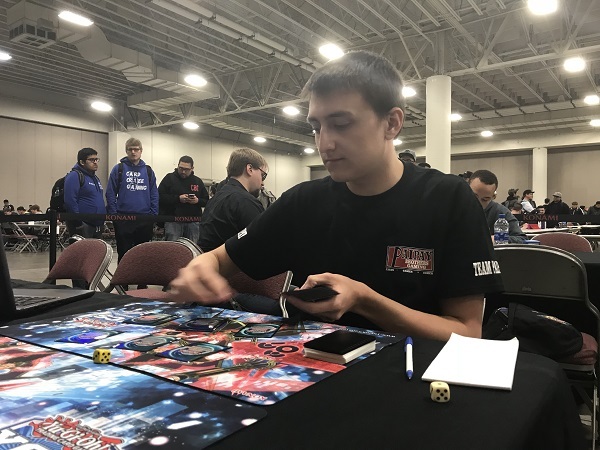 We’ve seen Logan Johnson in action before with his Trickstar Deck, but now he’s up against Leonard Anaya and his True Draco Deck. Who will advance to the Top 4? It’s time to Duel! Anaya won the roll and elected to go first. He started by Normal Summoning Amano-Iwato and then used Terraforming to add Dragonic Diagram from his Deck to his hand. He then activated Pot of Duality, revealing True Draco Apocalypse, True Draco Heritage, and True King’s Return. He chose to add True Draco Heritage to his hand, shuffling the other two cards back. Anaya then activated Dragonic Diagram, Set a card, and then used the effect of Diagram, destroying the Set Heritage to add another True Draco Heritage from his Deck to his hand. He activated that Heritage and used its effect to draw a card. He Set 2 more cards and in the End Phase Amano-Iwato returned to his hand. In Johnson’s Standby Phase, Anaya activated Anti-Spell Fragrance. Johnson Set 5 to the back row and passed. Anaya Normal Summoned Amano-Iwato again. 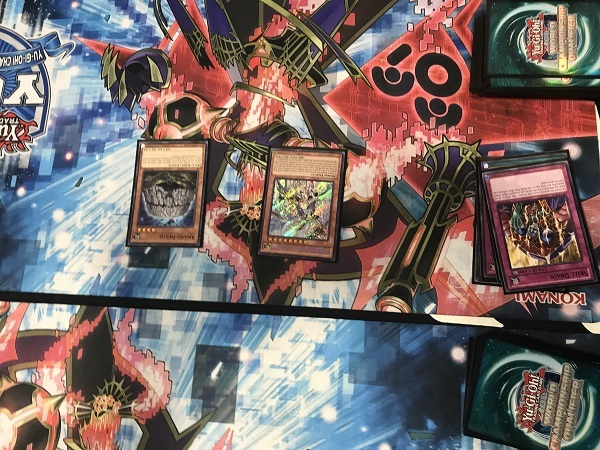 He then activated Dragonic Diagram, but Johnson Chained Heavy Storm Duster, targeting Dragonic Diagram and a face-down card that was Chained: Cosmic Cyclone! Anaya banished Johnson’s face-down Scapegoat which couldn’t be Chained because of Anti-Spell Fragrance. Anaya used the effect of True Draco Heritage to Tribute it and Anti-Spell Fragrance to Tribute Summon Master Peace, the True Dracoslaying King whose Summon was negated by Johnson’s Solemn Judgment! Anaya’s Heritage activated, destroying Johnson’s Set Blazing Mirror Force. Anaya attacked with Amano-Iwato for 1900 points of damage. in Main Phase 2, Anaya activated Skill Drain to keep Amano-Iwato on the field. Johnson drew Torrential Tribute for turn. He activated Pot of Duality, revealing Trickstar Light Stage, Rivalry of Warlords, and Solemn Strike. He picked Trickstar Light Stage and activated it to add Trickstar Lilybell to his hand and used the effect to Special Summon it in Defense Position. He Set Torrential Tribute and passed. Anaya activated Disciples of the True Dracophoenix and used its effect to shuffle back 2 copies of True Draco Heritage and a Master Peace, the True Dracoslaying King to draw a card. He then used Disciples of the True Dracophoenix to Tribute it and Skill Drain to Tribute Summon Master Peace, the True Dracoslaying King! Anaya used Disciples of the True Dracophoenix’s Graveyard effect to destroy Torrential Tribute, which was not Chained. Master Peace, the True Dracoslaying King destroyed Trickstar Lilybell by battle and Amano-Iwato attacked directly. Johnson drew and it was no help. He conceded and we’re going into the second Duel! Johnson elected for Anaya to go first. Anaya activated Dragonic Diagram and used the effect, destroying Called by the Grave from his hand to add True Draco Heritage from his Deck to his hand. He activated another Dragonic Diagram, Set True Draco Heritage and used the effect to destroy Heritage and add the third Heritage from his Deck to his hand. He then Normal Summoned Amano-Iwato and then activated Heritage and used the effect to draw a card. He Set 2 cards to the back and Amano-Iwato came back to his hand in the End Phase. Johnson started with Trickstar Light Stage and used its effect to add Trickstar Lycoris from his Deck to his hand. He used Light Stage’s effect to freeze Anaya’s left-most face-down card. He then used Terraforming to find another Trickstar Light Stage and activated it, adding another Trickstar Lycoris. He froze the same face-down with the new Light Stage. He then Normal Summoned Trickstar Candina and used the effect, but Anaya Chained Ash Blossom & Joyous Spring. Candina attacked directly, dropping Anaya down to 6000 Life Points. Johnson then used both Lycoris from his hand to Special Summon them and return the Candina back to his hand. Johnson Set 3 cards in Main Phase 2 and then Trickstar Light Stage forced Anaya to send Disciples of the True Dracophoenix to the Graveyard. Its effect activated, destroying Johnson’s Set Evenly Matched. Anaya drew, taking 800 points of damage. Johnson activated Trickstar Reincarnation and forced him to banish 2 cards from his hand and draw 2 new cards. The 2 cards were of no help and he couldn’t reverse the situation, so Anaya conceded and we’re going to a third and final Duel! Anaya elected for Johnson to go first. Johnson started with a hand of 2 copies of Trickstar Candina, Heavy Storm Duster, Ghost Ogre & Snow Rabbit, and Torrential Tribute. He Normal Summoned Trickstar Candina and used the effect to add Trickstar Light Stage to his hand, which was activated and added Trickstar Lycoris from his Deck to his hand. He Set Torrential Tribute and Heavy Storm Duster. Anaya Set 4 cards to the backrow. He then flipped a Set Terraforming to add Dragonic Diagram to his hand, taking 400 points of damage from Trickstar Candina. He then activated the Field Spell, taking another 400 points of damage. 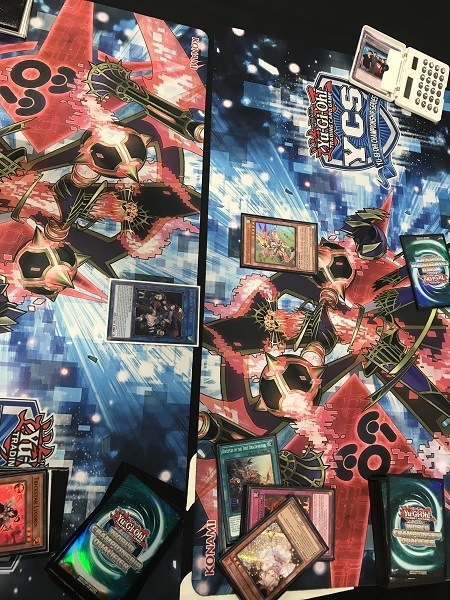 Anaya Set a card, then activated Dragonic Diagram; but Johnson Chained Ghost Ogre & Snow Rabbit to destroy the Field Spell. After the Chain resolved, Johnson activated Heavy Storm Duster, destroying Anaya’s Set Pot of Duality and Disciples of the True Dracophoenix. Disciples’s Graveyard effect destroyed Johnson’s Torrential Tribute. Anaya activated Pot of Duality, revealing Master Peace, the True Dracoslaying King; Majesty Maiden, the True Dracocaster; and True Draco Apocalypse. 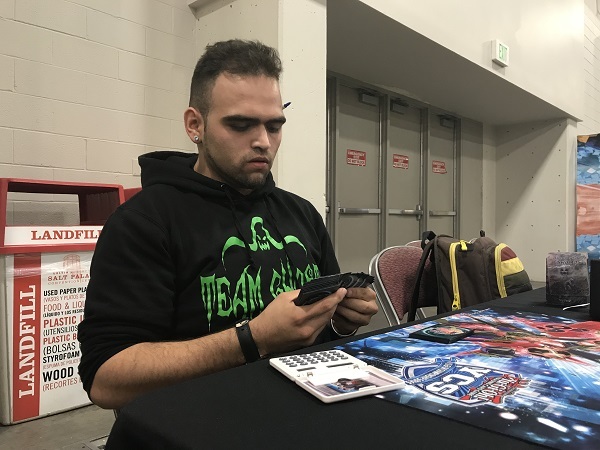 He picked Majesty Maiden, the True Dracocaster to add to his hand, taking another 400 points of damage from Trickstar Candina, dropping Anaya down to 6800. Anaya then Tributed his Set True Draco Apocalypse to Tribute Summon Majesty Maiden, the True Dracocaster. Apocalypse’s effect destroyed Candina. Majesty Maiden, the True Dracocaster attacked directly, leaving Johnson at 5700 LP. 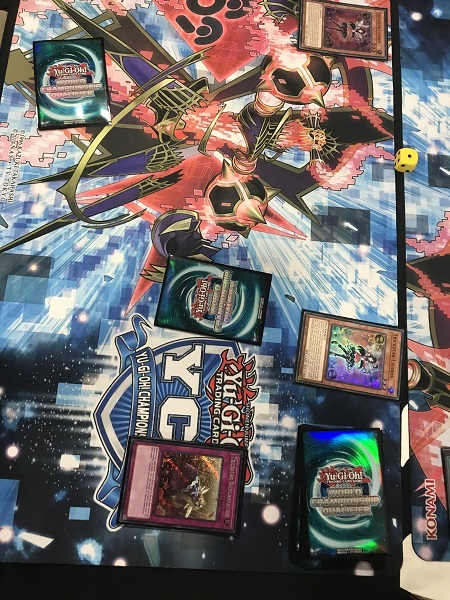 Johnson used Trickstar Light Stage to freeze Anaya’s last face-down card and Anaya Chained Majesty Maiden, the True Dracocaster’s effect, then Chained the Light Stage target: True King’s Return. Majesty Maiden’s effect added Master Peace, the True Dracoslaying King from his Deck to his hand. Johnson then activated another Trickstar Light Stage over the first one and added Trickstar Lycoris from his Deck to his hand. Johnson Normal Summoned Trickstar Candina and used her effect to add Trickstar Reincarnation from his Deck to his hand. His hand was now two copies of Trickstar Lycoris and one Trickstar Reincarnation. He went into the Battle Phase and swapped Candina for Lycoris. In the Main Phase, Johnson Set Trickstar Reincarnation, but Anaya activated the Tribute Summon effect of True King’s Return, Tributing True Draco Heritage and True King’s Return to Tribute Summon Master Peace, the True Dracoslaying King. Heritage destroyed Trickstar Light Stage and True King’s Return destroyed Lycoris. Then Master Peace, the True Dracoslaying King’s effect destroyed the face-down Trickstar Reincarnation. Anaya drew for turn and attacked with both monsters, taking both attacks and reducing Johnson to 450 LP. Johnson drew for turn, picking up Ash Blossom & Joyous Spring. He Normal Summoned Candina and used the effect to add Trickstar Lilybell to his hand, which was Special Summoned. Trickstar Lilybell attacked directly, and her effect added Trickstar Lycoris from his Graveyard to his hand. Trickstar Candina attacked Master Peace, the True Dracoslaying King, Johnson activated both copies of Trickstar Lycoris, Anaya Chained the effect of Majesty Maiden, the True Dracocaster, but Johnson Chained Ash Blossom & Joyous Spring to negate Majesty Maiden’s effect. In the Battle Phase, Johnson banished the Trickstar Reincarnation in his Graveyard to Special Summon Trickstar Candina in Defense Position. Anaya activated Master Peace, the True Dracoslaying King, banishing Disciples of the True Dracophoenix to destroy one of Johnson’s Trickstar Lycoris, cutting off a potential Link 4 play. Johnson used Trickstar Lilybell and Trickstar Candina to Link Summon Trickstar Crimson Heart. He tried to use the effect by discarding Trickstar Candina, but got hit with Anaya’s Ash Blossom & Joyous Spring. He then used Trickstar Crimson Heart and the other Lycoris to Link Summon Akashic Magician, bouncing Anaya’s Master Peace, the True Dracoslaying King back to his hand. Anaya’s Majesty Maiden, the True Dracocaster attacked Akashic Magician and that was it! Leonard Anaya moves on to the top 4! Top 4 Feature Match: Alessio Giordani vs. Ayinde Ross The Finals Are Underway!